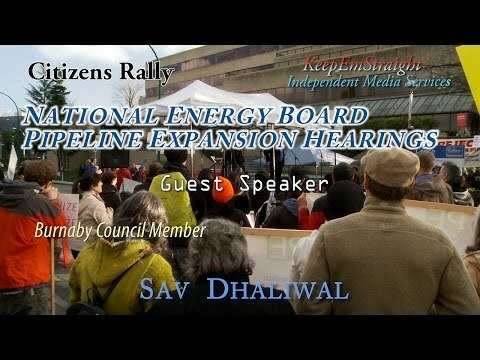 Elected Burnaby BC City Councillor Sav Dhaliwal speaks at a recent rally on location at the current NEB Kinder Morgan Pipeline Expansion review. Mr. Dhaliwal stresses his commitment on behalf of the city of Burnaby and it's citizens to continue the fight to stop this proposed pipeline expansion which is threatening the Canadian West Coast with increased Oil Tanker traffic (over 30 a month) in waters which are known to be hazardous to navigate & therefore pose a high risk of a major oil spill at some point in time. All this is being done for export purpose only and to also allow (at 2.39 in video clip) on location storage of 5.7 million barrels (by my calculations approximately 22 barrels of oil for every man woman and child living in Burnaby) of oil in fairly close proximity to a residential area is simply not acceptable by any stretch of the imagination..
Mr. Dhaliwal criticizes the powers that be for the way this public hearing is taking place & asks Prime Minister Justin Trudeau to intervene & correct the mistakes in judgment by the previous Harper Government & listen to the voices of the people he has sworn to represent. Perhaps regulations and contracts signed by a fradulently elected government should be thrown out the window ? Link to coverage on the topic of Election fraud mentioned By Sav Dhaliwal in this video clip.